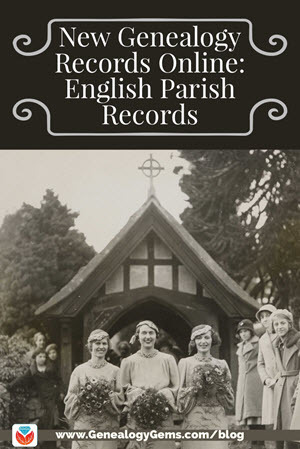 English parish records top this week’s list of new online genealogy records. More new or updated family history collections: British newspapers, pensions and India records; records for Brazil, Germany, The Netherlands, Peru, and Poland; UK images and deaths; US obituaries; newspapers for Delaware, Maine, New Hampshire and Rhode Island; and more for Idaho, Iowa, Kentucky, Louisiana and Oklahoma. As England made international news with the recent royal wedding last weekend, I found myself wondering what the couple’s entry in the official wedding register looks like (they signed it behind closed doors). That disappointment notwithstanding, plenty of historical Church of England registers have recently come online. 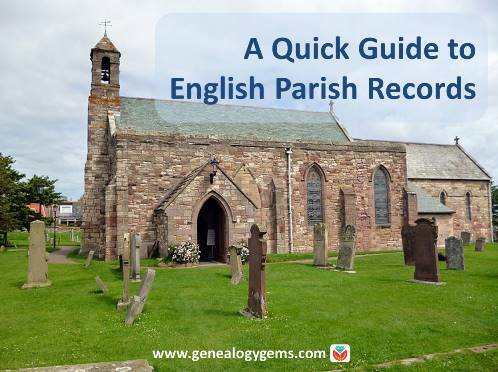 Cheshire, England, Extracted Church of England Parish Records, 1564-1837 at Ancestry.com is a new collection of historical parish registers from Cheshire and includes christenings, marriage bonds and licenses, marriage records, burials and even inhabitants lists. 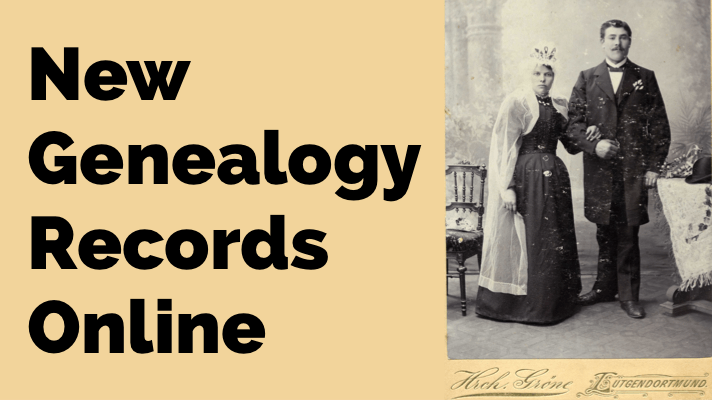 Derbyshire records at Ancestry.com. There are separate collections of marriages and banns, burials, and baptisms, marriages, and burials. Dates and record types overlap, so it’s worth searching across more than one of these collections for your family. Devon Bishop’s Transcripts, 1558-1887 at FamilySearch.org. Close to half a million indexed names have been added to this “index to and images of baptismal, marriage, and burial records in the county of Devon….Bishop’s transcripts contain more or less the same information as parish registers, so they are an invaluable resource when a parish register has been damaged, destroyed, or otherwise lost.” This collection is free to view, as all FamilySearch collections are, but the Devon Record Office, which supplies the collection, requires that you sign in with a free FamilySearch account. Rutland Registers & Records at Findmypast.com. Subscribers may now search 180 pages from registers of North Luffenham, 1565-1832, to uncover baptisms, marriages, burials and monumental inscriptions. Wiltshire Church of England records at Ancestry.com. There are separate collections of births and baptisms; marriages and banns; baptisms, marriages and burials; deaths and burials. 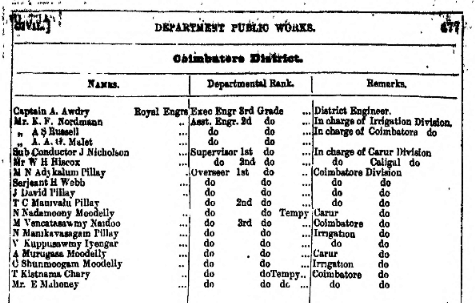 Sample page in 1878 British in India directory at Findmypast.com. Germany. Nearly 2.5 million indexed names have been added to FamilySearch’s free collection, Germany, Baden, Archdiocese of Freiburg im Breisgau, Catholic Church Records, 1678-1930. This database includes baptism, marriage and burial records. Another German collection at FamilySearch, Germany, Schleswig-Holstein, Kreis Steinburg, Civil Registration, 1874-1983, has also been updated. Additionally, Ancestry.com has recently published new German vital records collections: Menden (Sauerland) Births, 1874-1906, Menden (Sauerland) Marriages, 1874-1935 and Menden (Sauerland) Deaths, 1874-1986. Poland. Ancestry.com has published a new collection, Poland, Krakow Apartments of Displaced Jews, 1940. This comes from the World Memory Project in partnership with the United States Holocaust Memorial Museum, so these records are free to search (click here to search all USHMM collections for free). Brazil. FamilySearch has added over 35,000 indexed names to Brazil, Minas Gerais, Catholic Church Records, 1706-1999. These are “baptism, marriage, and death records created by various Catholic parishes and diocese,” and the collection continues to be updated. Additionally, nearly 60,000 names have been added to the FamilySearch database, Brazil, São Paulo, Immigration Cards, 1902-1980. UK images. The Irish Times and other news outlets recently picked up the news that subscription giant Ancestry.com published a new collection of historical images: UK, Historical Photographs and Prints, 1704-1989. The Irish Times reported that the collection “include[s] more than 120 images taken in Ireland, offer an insight into daily life in Irish cities, towns, villages and countryside between the late 1800s and the 1950s.” Just for fun, try browsing the collection on the different images categories, such as transport, nurses, navy, royalty or weddings (an image from the latter category is shown at the top of this article, in honor of the royal wedding). U.S obituaries. Findmypast.com has added over 2.5 million new records to its United States Obituary Notices index, which references data from Tribute.com, an online obituary news site. Delaware. MyHeritage.com has published over 125,000 pages in a new collection, Delaware Newspapers, 1880-2009 from three newspaper titles: The Sunday Morning Star, Cape Gazette and Delaware News. Idaho. 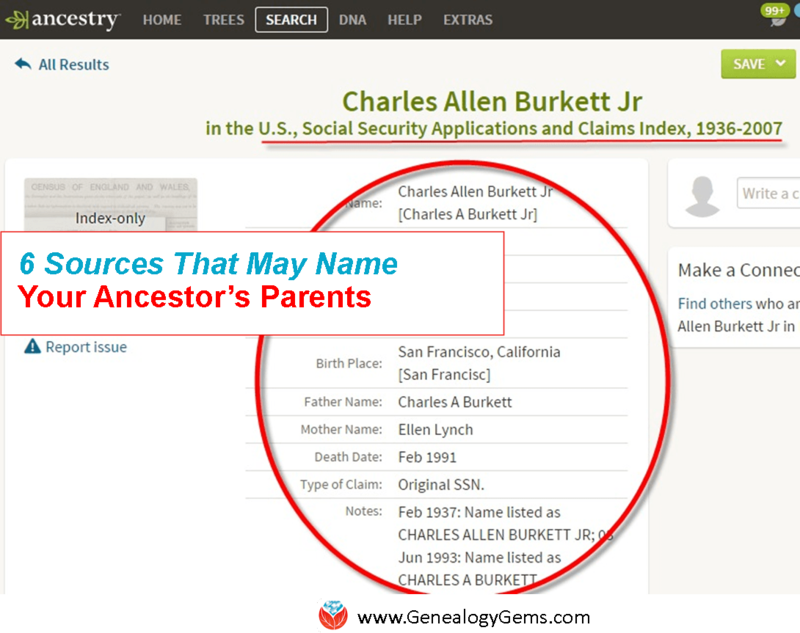 Ancestry.com has updated several vital records databases for this state, including: Idaho, Birth Index, 1861-1917, Stillbirth Index, 1905-1967, Idaho, County Birth and Death Records, 1863-1967, Idaho, Marriage Records, 1863-1967, Idaho, Divorce Records, 1947-1967 and Idaho, Death Records, 1890-1967. Kentucky. FamilySearch has added over 30,000 new records to its free collection, Kentucky Death Records, 1911-1965, which comprises indexed images of state death certificates. Maine. More than 2 million newspaper page images appear in the new MyHeritage.com collection, Maine Newspapers, 1861-2008. Among the 16 titles represented at present are Sun Journal, Bangor Daily News, Lewiston (Evening/Daily Evening/Wednesday/Saturday) Journal, Biddeford Weekly Journal, The Quoddy Times, Riddeford Journal, The Union and Journal, New Gloucester Independent News and The Original Irregular. New Hampshire. MyHeritage also published nearly 650,000 images in the new New Hampshire Newspapers, 1869-2008. The seven newspapers represented are The Telegraph, Nashua Daily Telegraph, Peterborough Transcript, The Milford Cabinet and Wilton Journal, Merrimack Journal, Hollis Brookline Journal and Bedford Journal. Rhode Island. MyHeritage.com has published nearly 600,000 digital images in the new collection, Rhode Island Newspapers, 1778-1938. At launch, the collection includes 26 titles. Among them are The Morning Herald, Evening Tribune, Providence News, Manufacturers and Farmers Journal, Evening Telegraph, Providence Evening Press, Providence Morning Star, Pawtuxet Valley Gleaner, Hope Valley Advertiser and more. England’s earliest useful census is from 1841, and civil records only go back to 1837. So England’s parish records just might prove your genealogical salvation. Click here to learn more about using them. When I clicked on the Rhode Island newspaper site, I was directed to a private site (McClellan-Morton site under My Heritage). Is this an error? The other sites seem Okay.